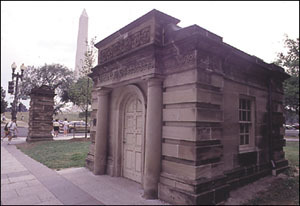 Poor-quality Aquia Creek sandstone was used in the Capitol gatehouses and gateposts built by Charles Bulfinch about 1829. These deteriorating structures show how rapidly the stone decays when it is exposed to the elements. They were moved from the Capitol grounds in 1874. One gatehouse and three gateposts are located at 15th Street and Constitution Avenue NW, and another gatehouse is farther west at 17th Street NW. Two more of the gateposts are in Fort Totten Park in northeast Washington. Aquia Creek sandstone of better quality was used for the original section of the National Portrait Gallery, which stands between 7th and 9th Streets and F and G Streets NW and was built between 1836 and 1840. The best places to see the Aquia Creek sandstone as it was used indoors are in the older parts of the Capitol and in the National Portrait Gallery courtyard. The sandstone gallery of the National Portrait Gallery, with its plain squat columns, is particularly impressive. In the Capitol Building, Aquia Creek sandstone may be seen in the walls and columns of the rooms adjoining the rotunda and in the spiral staircase. The graceful Little Rotunda tobacco column colonnade in the Senate wing on this floor, designed by architect Benjamin Latrobe, is especially attractive. Downstairs, the simple Doric sandstone columns of the crypt have a brownish cast, while the famous cornstalk columns in a nearby entrance hall are decidedly gray. "Calico Rock," a limestone conglomerate in the Leesburg Member of the Balls Bluff Siltstone, is the most striking building stone quarried near Washington, D.C. This stone was deposited at the mouths of ancient rivers in a series of alluvial fans in the western edge of the Triassic Lowland province in Maryland and Virginia. Called Potomac marble by builders, it is not marble but rather consists mainly of limestone and quartz pebbles and multicolored fragments, as much as 12 inches across, naturally cemented together. Samples of Potomac marble from various localities show marked differences in color. 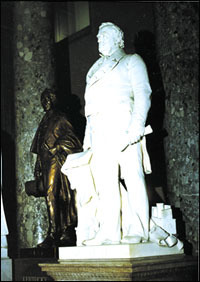 The Potomac marble in the Capitol is predominantly gray but shades to a rich reddish brown. The inclusions are gray, beige, yellow, black, white, brown, orange, and reddish brown in an indescribable variety of combinations. White veins of calcite accentuate the effects of the different colors. made of Potomac marble. Potomac marble was first used in 1815 by Benjamin Latrobe, who was then at work restoring the Capitol after it was burned by the British during the War of 1812. Latrobe described this stone as a very hard but beautiful marble and arranged to quarry it for the interior of the Capitol. Unfortunately, the beautiful conglomerate proved to be extremely difficult to work. The hard pebbles tended to break away from the softer matrix in which they were embedded. An apparently perfect block often contained flaws and would fall to pieces when worked. The columns of the Old Hall of Representatives in the Capitol are worth studying both for the stone itself, with its varied and richly colored inclusions, and for the long story of frustration the columns reveal. Instead of the monoliths envisioned by Latrobe, the columns are made up of drums of irregular lengths. No two columns are divided in the same way; each seems to have been treated as an individual problem. Black patches of wax cover voids where pebbles broke away, serving as a further reminder of the painstaking labor expended on these colorful columns.